formerly Xavier Institute, Salem Center, New York State, U.S.A.
Powers/Abilities: Cosmo displayed superhuman strength (probably up to Class 10) and could fly. He also had, at minimum, superhuman durability. He had ebon skin and his eyes were lit in electric blue when he was charged up, plus his costume glittered like stars. 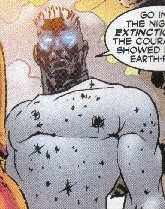 Interestingly, he seemed to have two different skin-tight outfits depending on the artist; van Sciver showed him as having white stars on black with short black hair, while Kordey (and Quitely) depicted him as having black stars on white with white hair (perhaps this inversion occurred when he was planet-bound?). 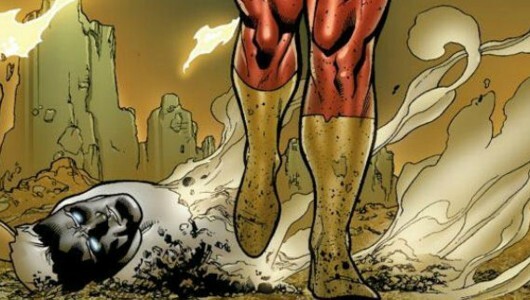 He was also equipped with mind armour against Phoenix. Interestingly, Cosmo was never too far from Gladiator, acting almost like a sidekick. History: (New X-Men I#123 - BTS) - The Shi'ar Empress, Lilandra, her mind controlled by the villainous Cassandra Nova, who inhabited Charles Xavier's body, arrived in lower Earth orbit with a team of Superguardians, including Cosmo, under the leadership of Gladiator. 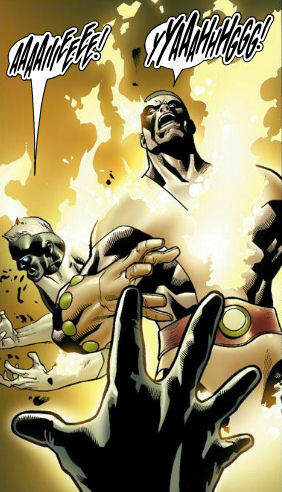 Cassandra Nova used Lilandra to enforce the power of the Imperial Superguardian Elite to attack the X-Men, using a lie that the mutants were infected and had to be exterminated. However, Smasher had escaped knowing the truth. (New X-Men I#123) - From an external observation deck of the Superdestroyer, which was parked over a think blanket of cloud, Gladiator led Arc, Cosmo and Squorm in an attack against the Xavier Institute, arriving in fiery trails on the Mansion grounds. (New X-Men I#124) - Cosmo helped to round up those mutants still outside the School and held Emma Frost as a golden dampening and immobilizing helmet was placed around her head. Leaving Stuff and Oracle to guard Angel and the Stepford Cuckoos, he flew off in search of more mutants. Alerted by Arc, Cosmo followed Gladiator into the Mansion to stop the counterattack of Beast and Wolverine. The two duos confonted each other. After Gladiator announced that the bladed mutant was to "sterilized", Cosmo asked that Wolverine show courage in facing death. (New X-Men I#124 - BTS) - Wolverine and Beast fought back but were easily overpowered by Cosmo and Gladiator. (New X-Men I#124) - With his heat vision, Gladiator attacked the ten-foot thick steel door that blocked entry to the School's vaults, where Phoenix, School mutants and reporters from the School's Open Day were hiding. Cosmo assisted by pulling back the softened metal. Cosmo, carrying Beast, and Gladiator, holding Wolverine, soon climbed through, dropping their beaten foes on the floor. Gladiator then challenged Phoenix, warning her of the mutants' imminent destruction. However, Cosmo stopped him once he saw Plutonia walk through the destroyed door holding the badly injured Smasher, who related the truth. 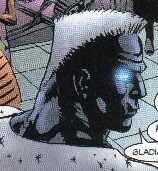 Hearing Smasher's account, Gladiator halted the Superguardians' attack on the X-Men. (New X-Men I#125) - Gladiator assembled the remaining Superguardians, including Smasher, Plutonia, Manta and Cosmo, against the threat of Cassandra Nova. Despite activating their mind armour, the five Superguardians fell quickly before Cassandra Nova, with Cosmo punching himself in the head. (New X-Men I#126) - Cassandra Nova, nestled inside Professor X's body, walked past the defeated Superguardians to confront the X-Men. Cosmo was covering his ears in agony at this point. (New X-Men I#133 - BTS) - Cosmo left Earth space along with the rest of Lilandra's Superguardians bound for Shi'ar space after the increasing and repeated manifestation of the Phoenix force in Jean Grey. (Uncanny X-Men I#477 - BTS) - The Imperial Guard was dispatched to defeat Vulcan, who’d been destroying ships in Shi’ar space. Comments: Created by Grant Morrison (writer), Ethan van Sciver with Tom Derenick (pencils) & Townsend, Miki, Hanna, Florea (inks). 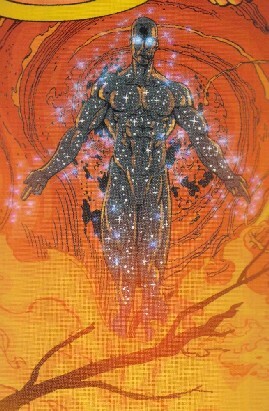 Although not actually named in the story, Grant Morrison revealed the character's name in an interview with X-Fan (thanks to www.uncannyxmen.net for this information; they also identify a similarity between Cosmo and an earlier Shi'ar superguardian, Neutron). Any other "Cosmo-" or "Cosmic" character.